As I have mentioned in my previous post, we took on a project which we thought would be done by the end of spring. Unfortunately, with the constant rain and mosquito infestation in the city, the project took longer to complete than we expected. However, it was definitely worth it. It was a lot of work but we couldn’t be any more proud of what we have accomplished. 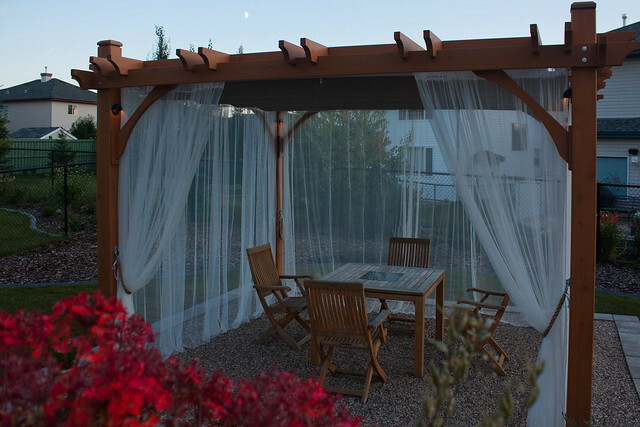 May I present, our backyard project — the pergola. The structure itself is made from red cedar which we bought as a kit from Outdoor Living Today. We enhanced the look of it by using premium cedar stain. Now that it’s up, it has become the focal point in our backyard. The hardest part of this whole project is actually installing the base, which as you can see, is halfway buried in the ground. It was very exhausting and back-breaking — digging the trench, laying and levelling the stones, pouring the concrete footings and filling it with gravel. However, it was necessary that the base be as solid as possible so the structure wouldn’t move during the freezing and thawing cycles. 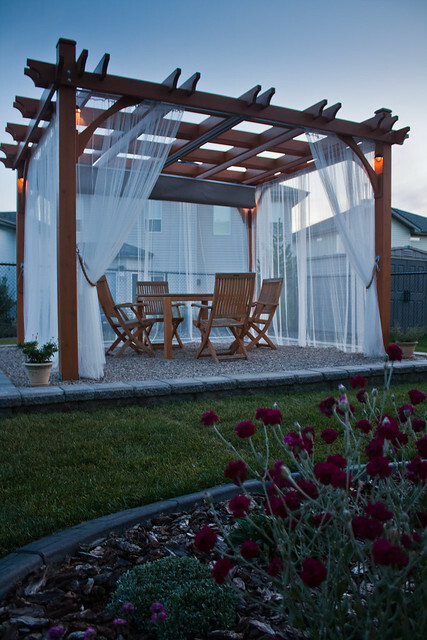 As with any outdoor project of this sort, we realized we had to improvise and find some creative ways to dress it up and soften the hard lines of the structure. We actually found a lot of items we needed from our local hardware store. 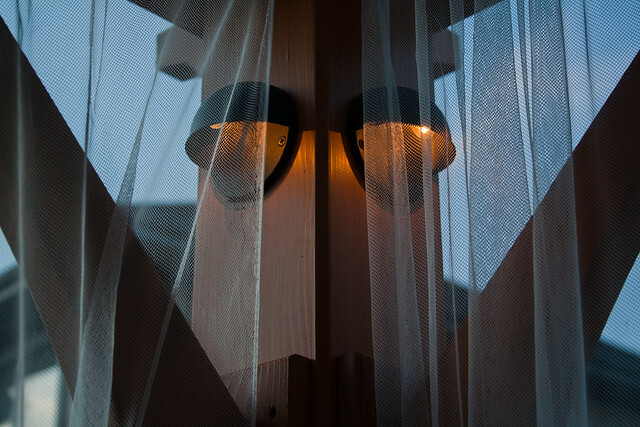 For instance, we bought a set of deck lights which we decided to install higher in order to provide some ambient lighting. They automatically come on at night and are connected to a timer. We also bought a few pairs of sheer curtains from Ikea. Not only were they very affordable but they also look really gorgeous. They’re made of polyester so they’re washable and could be used outdoors. 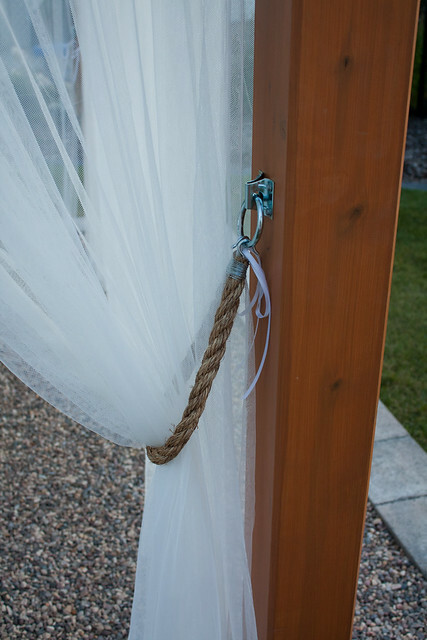 As for the tie-backs for the curtains, we made them out of manila rope, galvanized hooks and stainless steel wire. Good thing we also found these galvanized ring hitches to fasten the tie-backs to the posts and electrical conduits for the drapery rods. 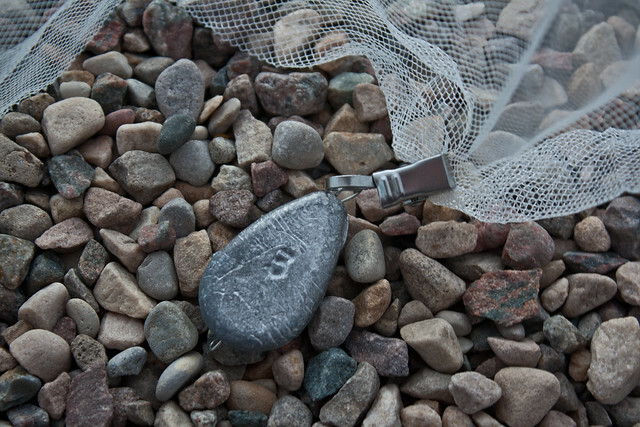 Lastly, we got these fishing weights and attached them to curtain clips. 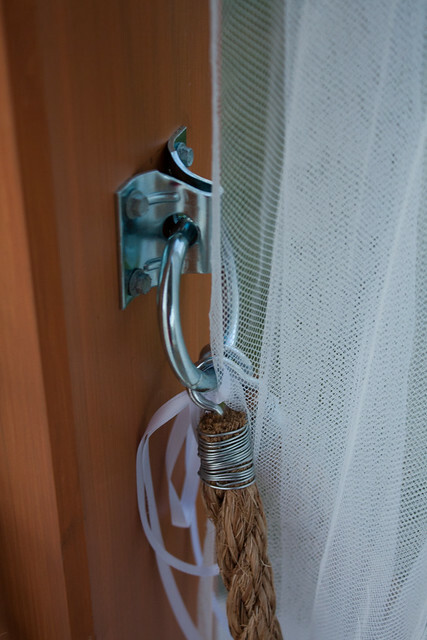 These were then affixed to the bottom of the curtains so they don’t get blown away when it gets windy. And there it is, a beautiful garden feature that will allow us to enjoy our backyard in the summer. 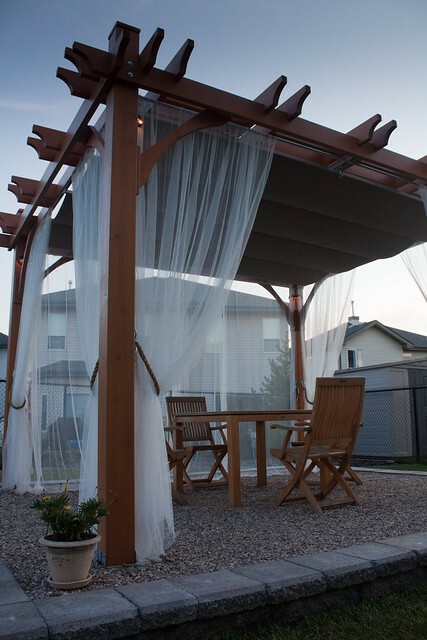 The retractable canopy will provide much needed shade as it can get pretty hot in the afternoons. We’re glad it is finally done. All that work during evenings and weekends have certainly paid off. The question we ask ourselves is, would we do it all over again? Absolutely! 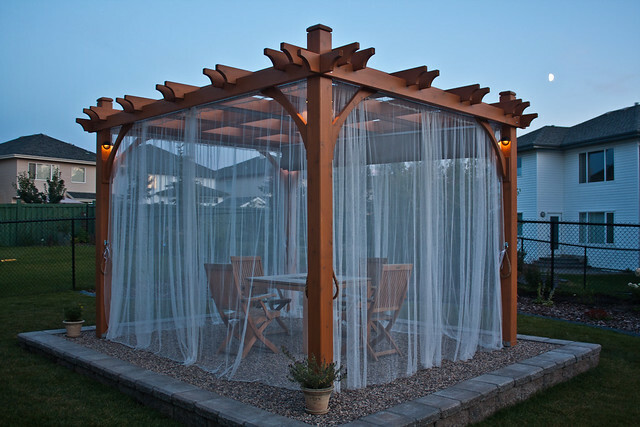 This entry was posted in House & Home and tagged canopy, cedar, curtain, garden, gravel, outdoors, pergola. Bookmark the permalink. Post a comment or leave a trackback: Trackback URL. Oh wow that looks absolutely beautiful. Well done guys! Thanks Uyen-chi! At least we got to enjoy it a few times before it got really cold. Ernie, your pergola is even more gorgeous than I imagined it. Well worth the effort!! Thanks Judy! We can’t wait for summer next year to enjoy it.